Why should I use DIESEL Formula STA-BIL Fuel Stabilizer®? In 2006, the EPA mandated the reformulation of diesel fuels, reducing sulfur content to less than 15 ppm. These newly reformulated diesel fuels, called Ultra Low Sulfur Diesel and Bio-Diesel, are less stable than diesel fuels of the past. The reduction in sulfur also means less lubrication to protect the diesel engine from wear, leading to more breakdowns and major engine problems. Diesel Formula STA-BIL® is specially formulated to help prevent sludge and sediment formation and the darkening of diesel fuel. 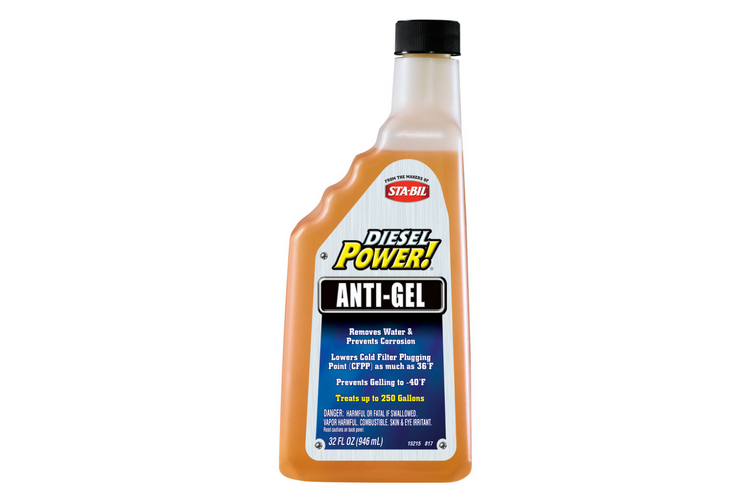 Diesel Formula STA-BIL® contains high levels of detergents and lubricity agents, and when used regularly, haleps remove these sediments as well as any engine deposits that may have already formed, in addition to lubricating critical fuel system components to kepp your diesel engine running like new. Does DIESEL Formula STA-BIL® also help remove water? How? Why is this important? Although water attraction can occur within the fuel tank at any time, when diesel fuel is stored for long periods, it is more likely to draw in moisture from the air. This growth can lead to a gummy mess within your fuel tank — clogging the entire system, and if not properly cleaned and maintained, causing your diesel engine to run poorly, if at all. Diesel STA-BIL® demulsifies the water (breaks the water into small droplets) dropping it to the bottom of the fuel tank, where the fuel/water separators remove the water from the fuel, allowing the fuel to move safely through the fuel system. By removing the water before the fuel flows through the fuel system, also helps protect against corrosion. In what types of fuel can DIESEL Formula STA-BIL® Fuel Stabilizer be used in? DIESEL Formula STA-BIL® is safe to use in ALL Diesel Fuels, including Ultra Low Sulfur Diesel and Bio-Diesel blends. It is also safe to use in ANY Diesel Engine, including Marine and Agricultural equipment. 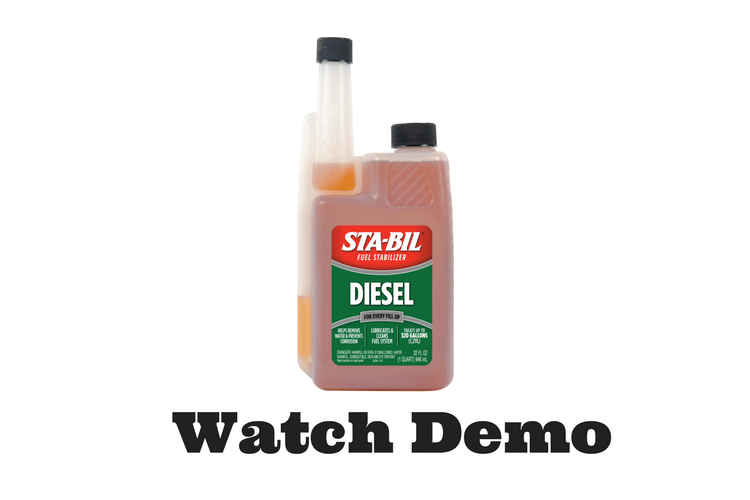 Can you use DIESEL Formula STA-BIL® in Home Heating Oil? 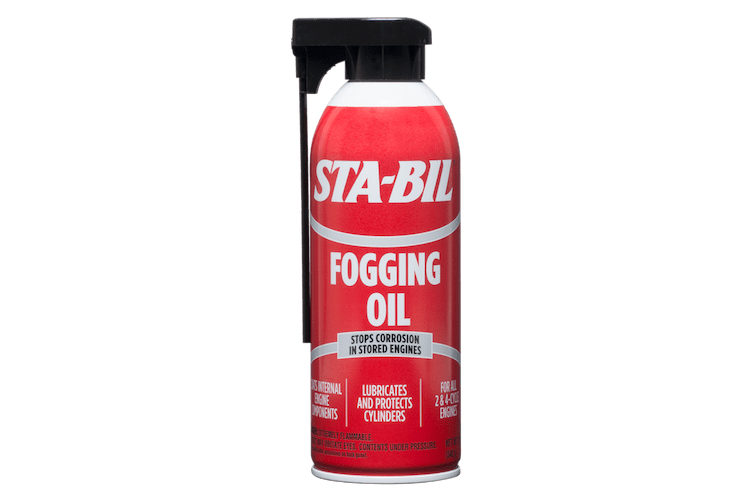 While this product was not specifically developed for this purpose, it is safe to use Diesel Formula STA-BIL® in Home Heating Oils. It will work well at keeping the burners clean, removing any water in the fuel and will also help stabilize the fuel, if stored for periods of time. 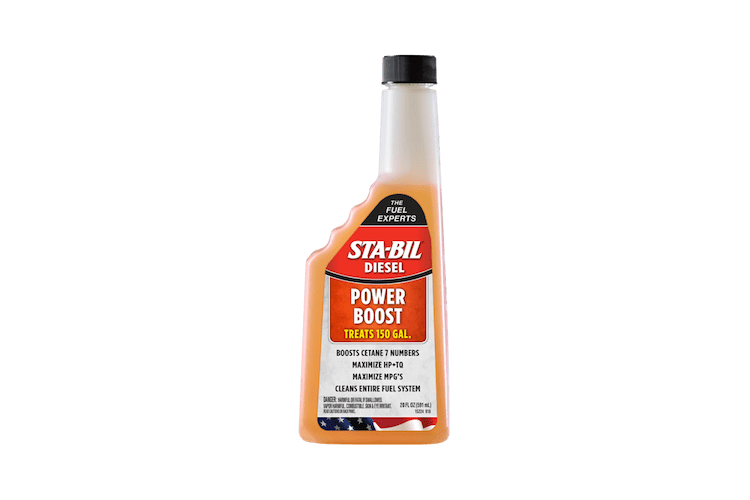 I thought Regular (Red) STA-BIL® Fuel Stabilizer worked in Diesel Fuel, how is Diesel Formula STA-BIL® better? Diesel fuel systems and gasoline systems are designed differently, and require different additives. In addition, regulations issued by the EPA over the last few years have resulted in diesel fuel reformulations (to Ultra Low Sulfur Diesel fuels), creating a need for more specialized diesel specific additives. In 2010, we created a special Diesel Formula STA-BIL, designed specifically to address problems related to the new Ultra Low Sulfur Diesel fuels and new diesel engine technologies, including thermal oxidation (heating of fuel), sludge and sediment formation, corrosion, and lubricity issues. It also helps remove water from the fuel. 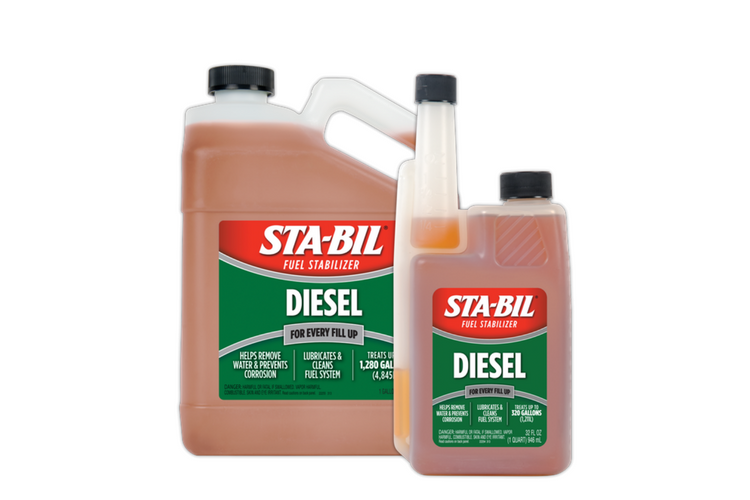 Using Regular STA-BIL® Fuel Stabilizer in Diesel will not harm the diesel system in anyway, but will not be effective. In addition, the red dye in Regular STA-BIL® Fuel Stabilizer can cause potential legal issues if used in On-Road Diesel Fuel, as Off-Road diesel fuel is purposely dyed red for tax purposes. How much DIESEL Formula STA-BIL® should I add to fuel? We recommend using DIESEL Formula STA-BIL® at EVERY FILL up to protect your fuel system year-round from sludge and sediment formation, water, corrosion, and breakdown of the fuel. For use in every tank, use 1 ounce in every 10 gallons of fuel. If using product only during storage, use 1 ounce in every 5 gallons of fuel. 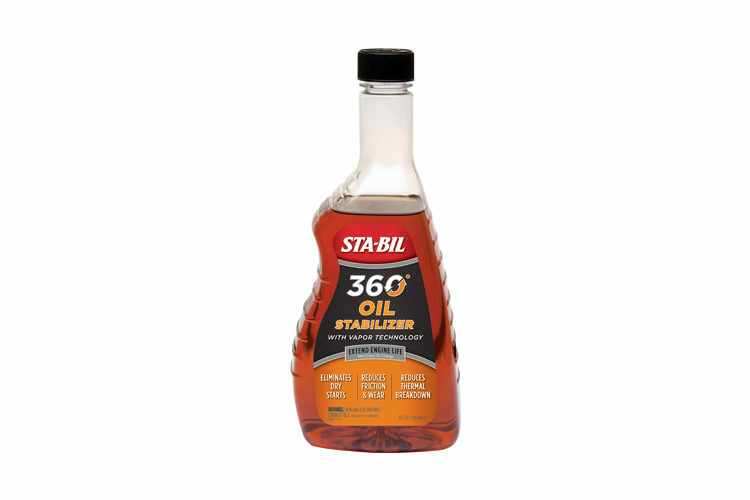 Diesel Formula STA-BIL® Fuel Stabilizer is rated 5.0 out of 5 by 2.